This is another chocolate cake I really really adore as it is butter-free and flourless! Sounds really healthy yah? ^0^ Even my two kids enjoyed this chocolate cake too thus the cake was completely wiped off by the 2nd day! Combine cocoa powder with boiling water and whisk till smooth. Add in vanilla paste, cool down. Combine ground almond, baking soda and salt. Place sugar, oil and eggs in a mixing bowl. Using a electric whisk, beat for 3 minutes until the mixture has aerated and thickened. Lower speed and beat in cocoa mixture. Tip in almond mixture and beat briefly. Scrape the mixture into a lined 8" cake pan. Bake in preheated oven at 160 deg cel for 45 mins. Cool in pan for 10mins. Gently loosen the edge with a spatula and turn the cake onto a serving plate. Leave to cool completely or serve while still warm. 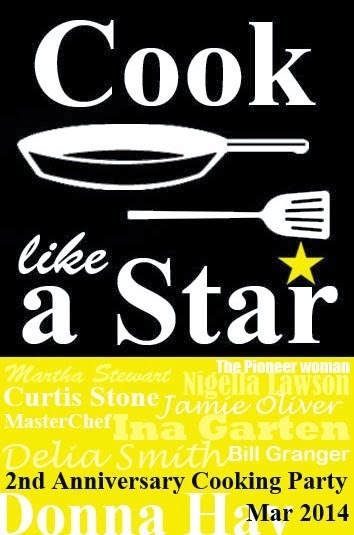 I'm linking this post to Cook Like A Star, All-Stars Anniversary Party, hosted by Zoe of Bake For Happy Kids, Mich of Piece of Cake and Joyce of Kitchen Flavours. Peng, you have just convinced me to bake this cake! I was concerned about using olive oil because of the smell but since your kids love it so much, it must be OK. Love the way you decorated your cake. Oooo I like this recipe! :) Butter free but looks delicious! This is definitely one of my favourite NIgella recipes. Today one of my colleagues baked a fantastic chocolate cake to the office. After eating everybody asked for the recipe. And it turned out to be your Chocolate Olive Cake. Very special n moist. Everybody started asking for your blog. You are a Celebrity in our office now!